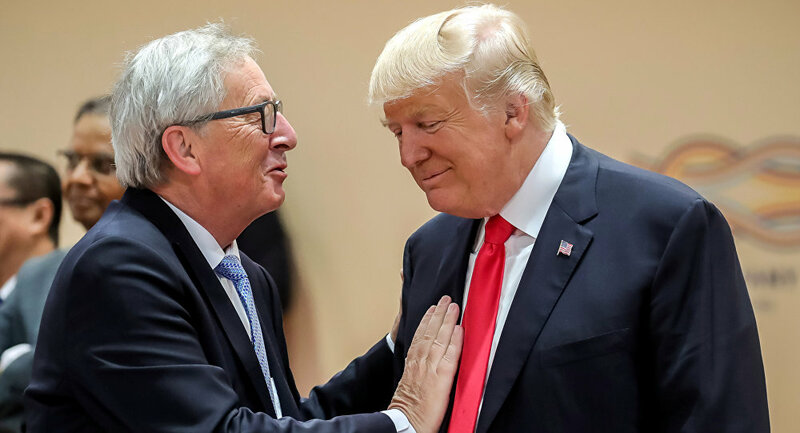 Washington considers the European Union not as an equivalent to a country, but as a bloc similar to the African Union, Jiri Vyvadil, a Czech lawyer and former minister of foreign affairs opined, while speaking to Sputnik Czech Republic. "At the funeral of former US President Bush Sr., the EU ambassador suddenly found out that he did not approach the hearse in the appropriate order prescribed by protocol, but at the end of the line, after all the ambassadors of individual states", the Czech politician elaborated. "For the EU, it was a shock… It was a slap in the face, and a big one. And this is the signal that everything is changing". Referring to the Czech media's prognosis that elections to the European Parliament in the Republic on 24-25 May could be hijacked by "anti-migrant, populist and non-systemic parties", Vyvadil suggested that these media platforms are stuck in a post-Cold War mentality: They still believe that in 1989 the West came out on top for good. "When 30 years ago, after the fall of the Iron Curtain, the US became the world leader, it gave the impression that it could do whatever it wanted with impunity. However, this is over", the politician noted. "At the military-geopolitical level, as a superpower, Russia has already outstripped [the US] while at the economic level [Washington] has been undoubtedly surpassed by China". Meanwhile, the EU is facing an "interesting struggle", according to Vyvadil, as the bloc has to sort out German Chancellor Angela Merkel's two fatal decisions, namely her support for the Ukrainian Euromaidan Revolution in 2014 and the open border refugee policy. "Along with Obama, she was the main organizer of Euromaidan in Kiev, the goal of which was… to humiliate Russia and oust it from the European space… And the same Merkel, during a television show, called upon Syrian refugees to come to Germany. And Europe, including those states which Merkel, of course, did not ask, was flooded by tens of thousands of Syrian refugees", the politician explained. According to the former Czech official, the migration issue and Russophobia, kicked off by the German chancellor, "will be the key points of the election campaign in the European Parliament — the distribution of votes will depend on [these issues]". Commenting on the potential results on the vote, Vyvadil weighed the chances of European populist forces vis-à-vis established parties. "In France… it's hard for Emmanuel Macron to offer anything to his people", the former official foresees. "Both Italian deputy prime ministers, the Five Star Movement's Di Maio and the League's Matteo Salvini expressed full support to the yellow vests, who seek Macron's resignation. Even if, he will not be removed from power as a president until the May elections, the support for his coalition will be greatly weakened. As a result, supporters of Marine Le Pen's National Front [National Rally] and [Jean-Luc] Melenchon's radical left party will win. By the way, both camps are well disposed towards Russia". As for Germany, he suggested that Merkel's left-leaning parties are likely to command support, but the Alternative for Germany (AfD) could boost its position. In Italy the Five Star Movement and the League are most likely to win while in Hungary Viktor Orban's Fidesz and Jobbik will come out on top, according to the Czech politician. "In general, I expect that the so-called populist forces, in other words, parties or movements fighting against the mainstream and the establishment, will win and, perhaps, with a margin", he concluded.